All the Ayaat cited above establish and confirm the Sunnah, i.e. that all the sayings and actions of the Messenger (s.a.w) are divine revelation from Allah. They confirm and establish the obligation of taking the Sunnah of the Messenger (s.a.w), whether they are his (s.a.w) statements or deeds, and the obligation of adhering to them in all affairs of life. All these Ayaat are definite in meaning and authenticity. actions and sayings, and considering them as an invalid source for Ahkaam whilst accepting the Quran alone is deemed an open disbelief (kufr suraah). Restricting oneself to taking the Quran and refusing to take what has been mentioned in the noble Sunnah is also an open kufr (kufr suraah). It is the view of the enemies of Islam who have worked and are still working to destroy Islam and remove it from existence. In other words, if one does not accept the traditionalist’s interpretation of the verses supposedly in support of their viewpoint on the Sunnah. One’s faith (iman) in God, the Quran, the Messengers and angels; the last Day and doing righteous deeds is practically of no or little relevance, to say the least (in the traditionalist worldview), and moreover, one is aspersed as a disbeliever or an apostate. Moreover, Believers or Muslims ought to verify and investigate the ‘knowledge’ they receive: Do not follow what you have no ˹sure˺ knowledge of. Indeed, all will be called to account for ˹their˺ hearing, sight, and heart [intellect]. (17:36). In actuality, what is being dismissed is mere human interpretation of the Ayaat and not the verses (Ayaat) of God [as asserted above], thus the accusation of kufr is baseless since there is no authority to rank with God [9:31]. Nor is there any question of authority of the messenger-ship of Prophet Muhammad (peace be upon him) [4:64-65]. Rather, the Quran is conclusive evidence for the prophethood (or messenger-ship) of Muhammad (peace be upon him) and not contrariwise [4:174]. 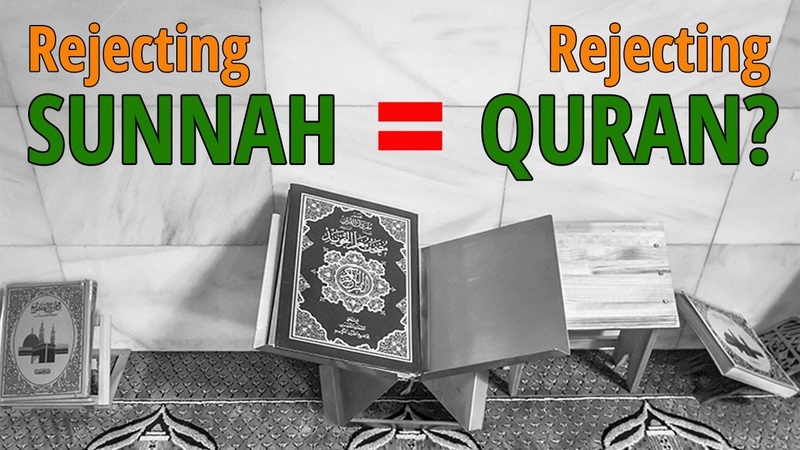 The irony is that, following and applying the Quran in daily life is adhering to the very ‘sunnah’ of the Prophet (peace be upon him) that is sought after, but by and large overlooked by the traditionalist. And the Messenger will say, O my Lord! My people did indeed treat this Quran as a thing abandoned (25:30). A believer or Muslim ought to be loyal to God and His message above any religion, denomination, school of thought, constitution, institution, sciences or scholars; despite the status quo and any prestige status ascribed to the chieftains and dignitaries of respective communities.